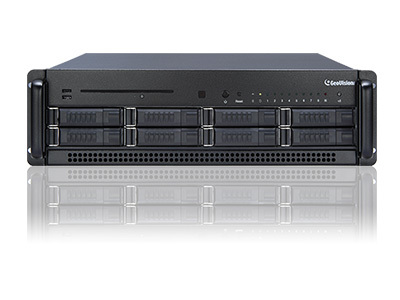 GV-Hot Swap Control Center System is a 3U 8-bay surveillance system. With its strong display functionality, users can connect up to 9 monitors to the system, as three of them can be 4K monitors (4096 x 2160). 9-mointor displays empower the multi-monitor applications of GV-Control Center– Matrix View and Video Wall. Matrix View allows you to monitor up to 768 cameras on 8 monitors. With Video Wall, you can manage the layout of multiple monitors and output videos across different monitors. 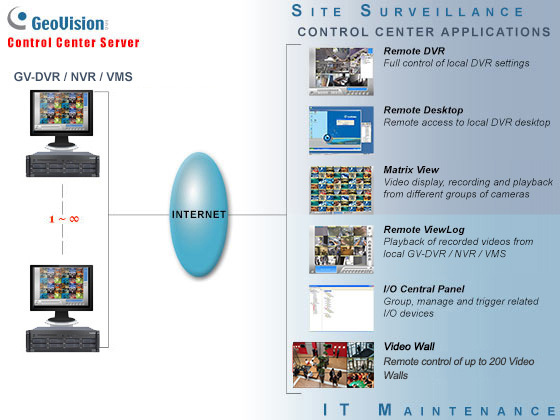 The GV-Control Center is a comprehensive solution for central operators to efficiently control GV-DVR / NVR / VMS, I/O devices and a variety of GeoVision software and hardware products. With GV-Control Center, multiple GeoVision surveillance and video management systems can be managed and maintained efficiently to enhance their monitoring performance and ensure smooth operation. 1. All specifications are subject to change without notice. 2. If you output videos across different monitors, the monitors will either flicker or drop frames. To solve this issue, in GV-Control Center, click System, click Configure, click Video Wall and disable Direct Draw. 3. If you want to use an external VGA card, it is required to connect a monitor to the onboard VGA to activate GPU decoding. The following camera brands and models have been tested for compatibility with GV-Control Center. GV-Control Center also allows for integration with all other IP video devices compatible with ONVIF, PSIA standards, or RTSP protocol. GV-IO Box (8 Ports) GV-IO Box 8 Ports provides 8 inputs and 8 relay outputs, and supports both DC and AC output voltages. You can connect through network by using its Ethernet module. Note: GV-Control center can only connect to GV-IO Box 8/16 ports through network. GV-IO Box (16 Ports) GV-IO Box 16 Ports provides 16 inputs and 16 relay outputs, and supports both DC and AC output voltages. You can connect through network by using its Ethernet module. GV-Joystick V2 GV-Joystick V2 allows you to easily control PTZ cameras. It can be either plugged into the GV-Control Center for independent use or connected to GV-Keyboard. GV-Keyboard V3 GV-Keyboard V3 is used to program and operate GV-Control Center and PTZ cameras. Through RS-485 configuration, it can control up to 36 GV-Control Center. In addition, you can connect PTZ cameras directly to the keyboard for PTZ control. Redundant Power Supply The Redundant Power Supply comes with 2 hot‐swap modules for 3U models and 3 hot‐swap modules for 4U models. When 1 module is down, the remaining module(s) can still supply full power to the system. The optional accessories will be built in the GV-Hot Swap Surveillance System V5 (Rev. B) and tested before shipment. Opening the case and installing the accessories yourself will void the warranty. 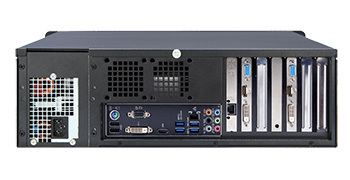 The optional accessories are only supported in GV-Hot Swap Surveillance System V5 (Rev. B) or later.